My name is Sandi Smith and I live in Newfoundland, Canada with my wonderful husband and 2 great kids, Rick is 22 and Claudine is 14.I did my first layout in January 2010 and was immediately hooked! I am obsessed with all things associated with scrapping and I am always in “scrapbook mode “, constantly looking at things in our everyday lives for sources of inspiration. I love to tear, wrinkle, sew and to get messy with gesso, mists and paint. I also love to refinish antique furniture and my latest love is painting girls on mixed media backgrounds. I don`t feel I have a definite style. 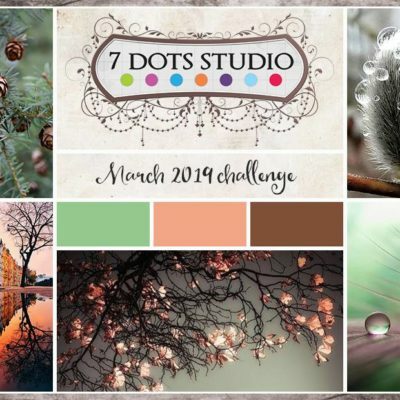 My creations can be vintage, shabby chic or loaded with paints ,sprays and gesso…depends on my mood and what inspires me at that time.I tend to gravitate towards creating 12 x 12 layouts but I also love stepping outside my comfort zone and trying something new! 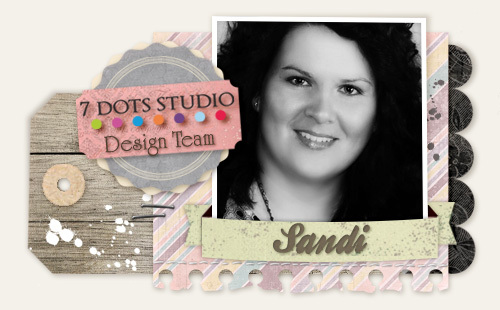 I am so honored and excited to be part of this AMAZING team and look forward to sharing my 7 Dots creations with you. Thanks so much to Tusia for this awesome opportunity!